So these two young Germans showed up at my house. Not any Germans. Special ones. The son and daughter of love of my life. We hadn’t been together as a trio for a very long time and it was lovely. All this goes a little way to explain why I haven’t written for a while. I can’t write about eating alone when I’m not. So this little entry will just give a little sunlight to the pure joy of cooking for others, and the sublime nature of doing it for those you love. But possibly my favourite evening was the one around my table. Until last week, the last really happy night we had all together was in my home in Bali. They had spent a couple of weeks alone there with their dad and I arrived for the last night. SE Asia is a big part of my life. Cooking the food from that region is like a little salve on my soul when I feel a long way from the rice fields of Ubud. 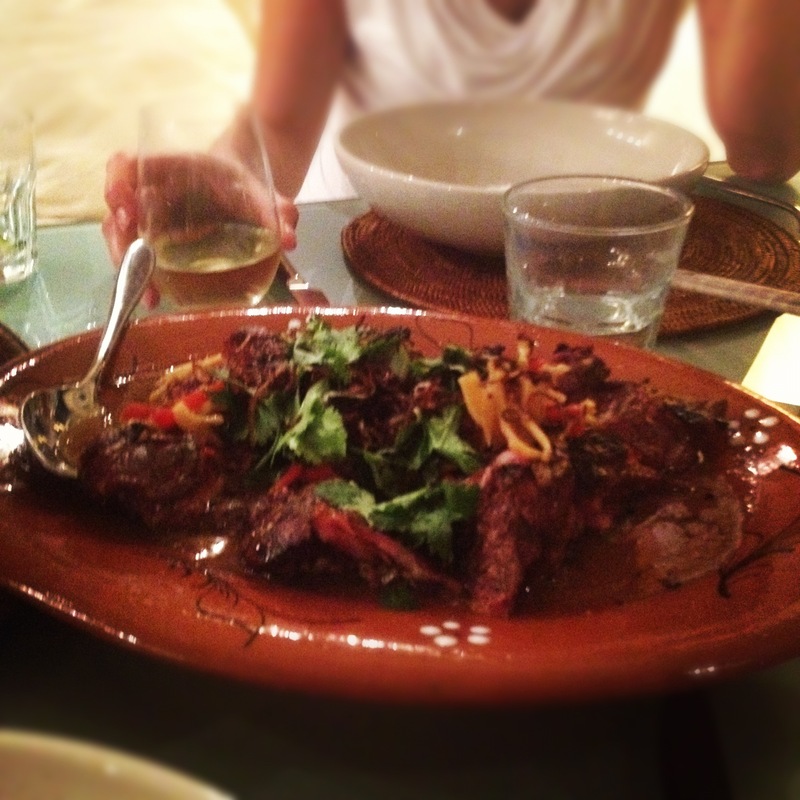 That last night together, we went to one of the better known restaurants on the island, some would say the best – Mosaic. But given the choice I like the dive bars and warungs that line the streets. And it’s the food that you’d find there that I mostly cook at home. 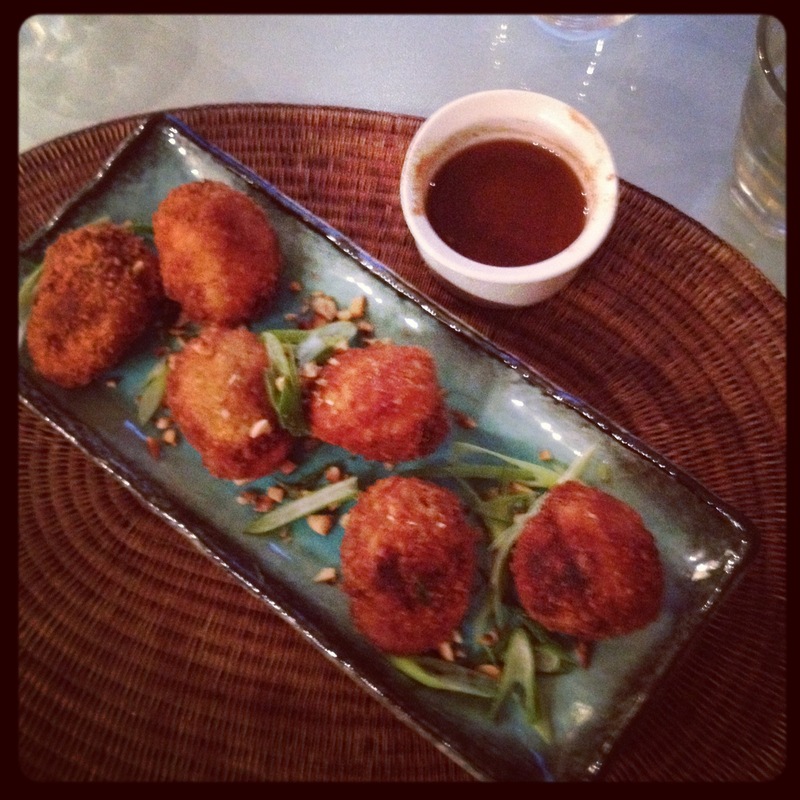 I love anything deep fried and so couldn’t resist doing an Asian devilled egg. Another no-brainer. Hard boiled eggs relieved of their yellows, mixed with seasoned minced pork, chili, spring onion, put back into the half egg, floured, egg washed and covered in panko. A little tamarind and kecap manis dipping sauce and a few roasted peanuts and shards of spring onion sets the whole dish off as a pretty good foil for a limey, ginny cocktail or two. I can’t do a meal from this region without my interpretation of Larb – that fresh and crunchy salad of green papaya and whatever else you feel like, dressed with lime juice, palm sugar and fish sauce. 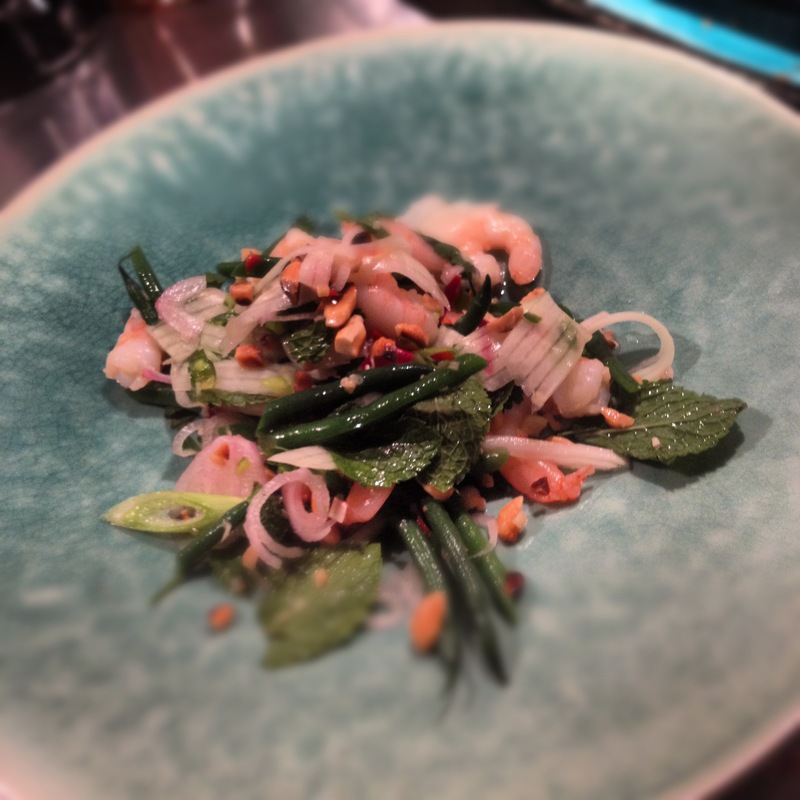 I threw in some barely cooked prawns, spring onion, shallots, blanched fine beans,cucumber, and lots more peanuts. The herbs are key here – mint and coriander added at the last minute. Perfect. A little hint – if you can’t get a green papaya (or if you can’t face paying £8 a kilo for something you can pick like a weed in SE Asia) use a really unripe mango slithered through a mandolin. 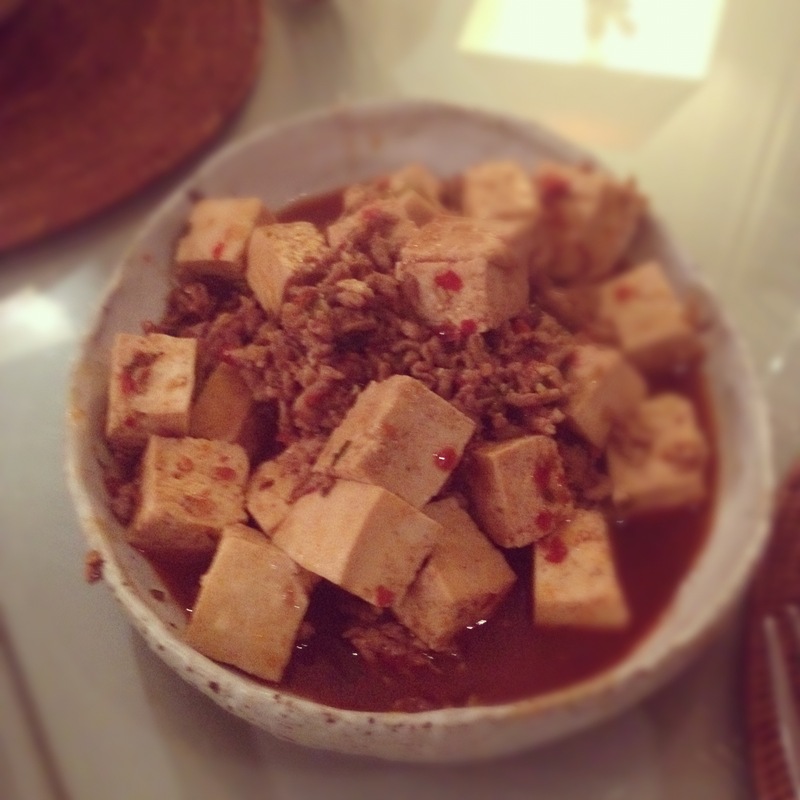 For some serious heat, a tofu stew with minced pork, sweet chili and ginger. A kind of ma po. Steamed rice soothed the burning taste buds. Pudding was my favourite hot and cold combo. But no chocolate this time. Never ever at the end of all this spice. That would be just all wrong. We had a melon sorbet with a buttery lime and ginger caramel sauce. But the food wasn’t the focus of the evening. As ever, it was just a catalyst for what is really important in life: People, friends, family, talking, listening and laughing. It was a special night. 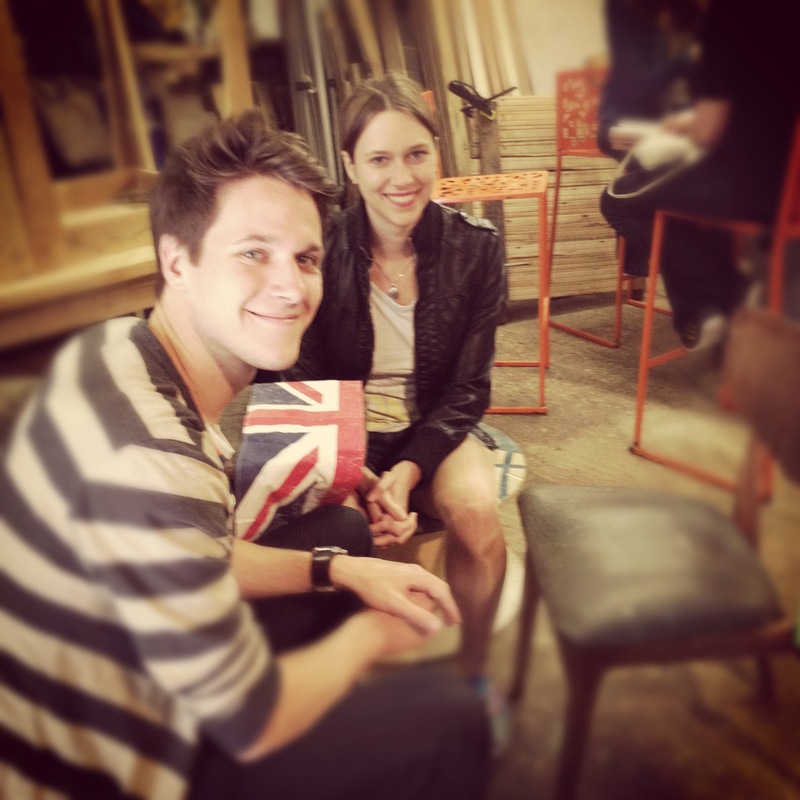 Lots of catching up, gentle teasing and inquiry about the course of these two wonderful young lives. Only one thing was missing…but he was there, shining brightly in them both. I feel blessed that they choose to still be in my life. If anyone would like recipes for any of these dishes, do let me know. Happy to supply but only writing up recipes for 1 on the blog as is.